of stoutly potted slender ovoid form surmounted by a straight cylindrical neck rising from the steeply rounded shoulders to a wide mouth with rolled-out lip rim, the sides tapering down to a flat ring foot enclosing the slightly recessed base, the transparent glaze of creamy white tone continuing over the base, the edge of the footrim left unglazed revealing the fine white porcellaneous ware. 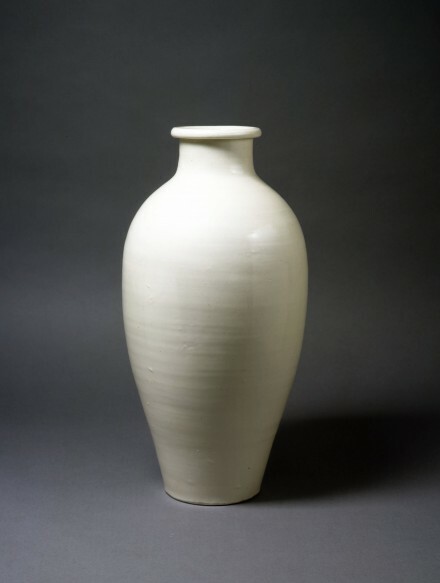 Compare the slightly smaller Song dynasty white porcelain vase of related form from the Avery Brundage Collection in the Asian Art Museum of San Francisco illustrated by He in Chinese Ceramics- The New Standard Guide, London, 1996, p. 149, no. 227, described as “Hebei (ding)”.